This is the fifth and final chunk of data and analysis from the 2016 Novelist Income Survey. This is where I look at all the other random and miscellaneous data points that either didn’t fit elsewhere, or else I couldn’t figure out quite what to do with them. After this, I’ll be pulling everything together into a single downloadable report for folks. Who Lost Money in 2016? 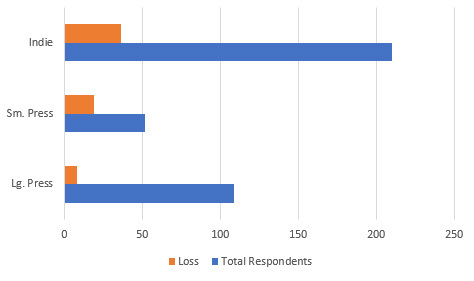 One thing I found interesting — of the 371 people who provided gross income and expenses data, 63 ended up with a net loss in 2016. In other words, roughly one out of six published novelists lost money last year. 17 of these identified as full-time writers, with the other 46 being part-time. Looking at the overall number of full- and part-time respondents, the part-time authors were disproportionately more likely to end up in the red. How did those 63 authors break down in terms of indie/small press/large press? We can also look at the percentage of novelists who lost money in each category, which is perhaps a little more illuminating. As always, be careful about drawing too many conclusions from this. I messed up on this part. I asked people what genre(s) they published in during 2016, and let people check as many boxes as they liked, with an additional field for “Other.” This meant I got pretty accurate data, but a lot of folks selected multiple genres, which made it harder for me to do much with the data. In the future, I think I need to ask people to choose their primary genre instead. 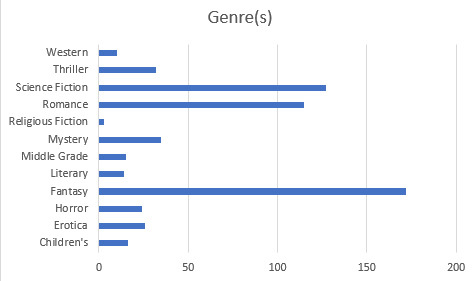 Looking at which genres were chosen, we can see that the data are slanted toward SF/F and Romance. As a SF/F person myself, it makes sense that my outreach on the survey would bring in a lot of my fellow SF/F authors. Basically, what this means is that the results and conclusions may not apply as strongly to, say, religious fiction as they do to fantasy or romance. 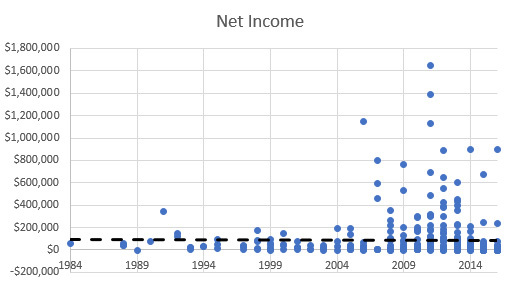 What happens when you plot net income against the year the author published their first book? I removed one outlier — an author who made close to five million, and whose first book came out near the middle of the range. The results were not what I expected. That trendline is pretty much horizontal, suggesting little to no relation between how long you’ve been publishing and how much money you make. Running the correlation function in Excel gave a correlation of 0.01. I can see several ways of thinking about this. One is that you can spend 30 years writing books, and it doesn’t mean you’re more likely to be financially successful. Which is depressing as hell. But maybe it just means financial success can come at any time. Or maybe writers who broke in a long time ago aren’t as prolific these days, which is why their income was comparable to newer authors who might be more active? I honestly don’t know, and I suspect you’d need a lot more analysis — and probably a lot more data — to draw any firm conclusions here. That’s pretty much everything I can do with the data. All that’s left now is for me to pull it all together into a single report. I’ll be incorporating some of the feedback and suggestions from the comments as well, thank you. I’ll also be anonymizing the data and sharing that for folks to play with. I hope this has been helpful and illuminating for folks! My suggestion is to ask how many books in each checked genre were published in the year, instead of just primary genre.